Knoxville Arts & Culture Attractions feature monuments, museums, art galleries, and an annual Dogwood Arts Festival. The Beck Center researches, collects, preserves. and exhibits African American achievements and culture and has the largest African American membership organization in East TN. Since its opening in 1975, the Center has reached more than a half million people from local residents to individuals from all over the world. This has been achieved through cultural exhibits and resource materials including: books, journals, newspapers, scrapbooks, audio recording and other memorabilia. 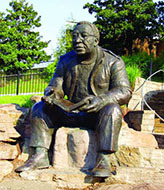 The Center is located within walking distance of the famed Alex Haley statue. The Children's Museum of Oak Ridge is a dynamic cultural center that features innovative exhibitions, programs and workshops for all ages. Science, art and history are emphasized in hands-on learning opportunities that encourage young people to understand their cultural heritage, environment and the world around them. Educators are encouraged to utilize the Museum's numerous resources - over 20,000 objects, archival holdings, audio/video tapes, books and magazines. The Arts & Culture Alliance of Greater Knoxville serves and supports a diverse community of artists, arts organizations, and cultural institutions by assuring their creative, financial, and operational well being. The Arts & Culture Alliance provides leadership and advocacy that establishes and maintains the success of the arts and cultural environment of greater Knoxville, as well as providing for a strong climate for cultural and economic interaction between the arts and the community as a whole. The Ewing Gallery of Art and Architecture is named in honor of C. Kermit "Buck" Ewing who initiated the art curriculum at the University of Tenneessee, Knoxville in 1948. Its permanent collection consists of approximately 3000 objects: General contemporary in all media; Asian, Graphic Design/Illustration, Architectural Drawings/Photographs. The museum portrays Native Americans of East Tennessee history with artifacts representing 5,000 years of Native American life related to hunting, pottery, foodways, ceremony, games, medicine, and trade. Depicts pioneer and mountain culture's daily life, family and community, medicine, industry, recreation, and education. An exhibit, Tennessee on the Move, has a postal wagon, farming vehicles, a surrey, a freight wagon, and road construction equipment. Founded in 1961 as the Dulin Gallery of Art, the Knoxville Museum of Art moved into its current facility in World's Fair Park on March 25, 1990. Designed by noted museum architect Edward Larrabee Barnes, this 53,000 square foot concrete and Tennessee pink marble building features five galleries, the Great Hall, auditorium, Museum Shop, and various gardens and terraces. KMA received accreditation from the American Association of Museums in 1996. The McClung Museum is a general museum with collections in anthropology, archaeology, decorative arts, medicine, local history, and natural history. The exhibits document ways of life, cultural trends, and technologies from prehistoric times to the present day, and showcase much of Tennessee's past -- its geology, history, art, and culture. The Museum of Appalachia portrays an authentic mountain farm/village with 36 historic log structures, exhibit buildings filled with thousands of authentic Appalachian artifacts, gardens surrounded by split rail fences, and farm animals in a picturesque setting.